Prior to the start to All In, Bullet Club OG Tama Tonga interacted with WrestleZone's Angel Garcia, where 'The Bad Boy' opened up regarding him heading back to New Japan Pro Wrestling following his suspension, the value of title belts and the one final message he had for The Elite ahead of All In. After initially forming The Firing Squad at The G1 Specials in San Francisco, former three-time IWGP Tag Team Champion Tama Tonga, alongside his fellow Bullet Club Firing Squad members have made it to the news for all the controversial reasons, thanks to their recently developed notorious behaviour in NJPW. 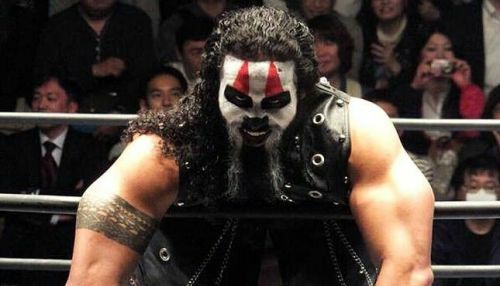 Tama Tonga noted that his recent vacation was indeed a very expensive one, but 'The Bad Boy' has mostly been spending time with his family and been drinking cervezas. Tonga also added that he will be returning to work on Monday. "That was an expensive vacation but I’m enjoying it. I’m spending time with my family drinking cervezas and I’m back to work on Monday." When asked about potentially challenging for a title, Tama didn't have much to say and simply stated that he doesn't care about a title belt and is here to make money. "F*ck a title. I’m here to make money." Once again, Tama didn't have much to say and went on to wish The Elite good luck ahead of All In. Tama Tonga is currently slated to challenge for the IWGP Tag Titles upon his return to NJPW, as he and his brother Tanga Loa will be challenging The Young Bucks at Fighting Spirit Unleashed.